I am not an unalloyed fan of the liturgical reforms of Pope St Pius X, for all sorts of reasons. And, liturgically speaking, I am not that happy about the giving of Communion before Confirmation. Pastorally speaking, on the other hand, I am a huge fan. We have just had two splendid ceremonies: last weekend, Bishop Kieran came to our parish and confirmed seventeen young people (fifteen teenagers and two in their twenties); yesterday I gave first Holy Communion to twenty-six children. Both occasions were deeply moving. 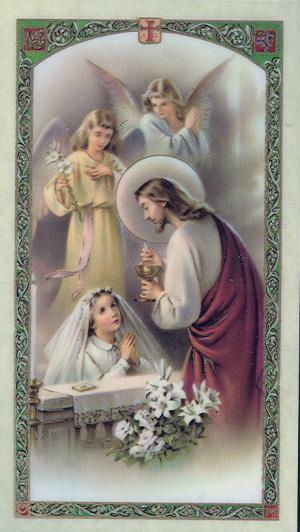 After the Communions yesterday, returning to the house, I saw a nice neighbour sitting in her car, and I went across to apologize for the fact that parking had been so difficult in the streets around. 'We had first Communions this morning', I explained. 'I know', she said. 'I was watching all those happy families, and the children all dressed up and so excited'. She turned towards me, and I could see tears in her eyes. 'I long to be able to believe like that', she said. And we had a little chat about this and that. There are few things more beautiful on earth. A good piece here, by In hoc signo vinces. I have just had a visit from my opposite number at the Methodist church here in Shoreham. He is due to be ordained soon (though he has been the minister for some two years now), and he tells me that he must have a 'supporter' at the ceremony, due to take place in Portsmouth (Anglican) cathedral. This supporter may be of any (presumably Christian) faith except Anglican. He shrugged, and said 'historical reasons'. 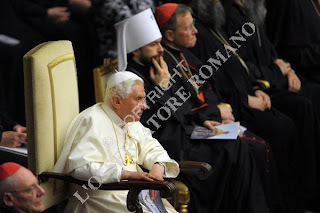 While I was in Rome, the Patriarch of Moscow very kindly treated the Holy Father to an evening of music. Strangely, I didn't get an invitation, but I spoke to someone who was there, and said that the evening was wonderful. My post is shameless, I'm afraid: I thought some time ago of the pun rus in urbe, and I have been longing for a chance to try it out! I have been away for a few days; for years I have been promising the seminarians to whom I teach Church History that I would go with them to Rome and put a lot of what I have been saying in context. This year, Dominic Findlay-Wilson called my bluff and said that he would do the travel-agent stuff if I came up with the talking stuff. And, bravely braving volcanic ash and strikes (we flew BA) our little group finally made it and back!. I thought I might share with you a few pics of the event which, thank the Lord, went very well indeed. This is the view from my bed: if I had a better camera, I could have shown you my feet. Roman cognoscenti among you should be able to tell where I stayed. Here's a photo which will only mean something to people who studied at St John's Seminary, Wonersh. Mgr Ernest Moodie (commemorated on this plaque located in the Blessed Sacrament chapel of the Lateran Basilica) was a seminarian at Wonersh in the early twentieth century and after his ordination, so it is said, was left huge pots of money with which he bought a flat in New York, another in London, a third in Rome, and a canonry at St John Lateran. Let it not be thought, though, that he was a man without a conscience; he was a generous benefactor of all sorts of causes, among them the fabric of St John Lateran (hence the plaque) and St John's Seminary (where there are two plaques). This next simply piqued my curiosity. I stumbled across it (nearly literally, since it is set into the floor) in the Dominican church of Santa Maria sopra Minerva. Anybody know anything (to save me the labour of going to Wikipedia)? We went to the English College for Mass one evening, and were entertained to dinner and a fascinating tour of the College by its rector, Mgr Nicholas Hudson. Several students thought this the highlight of the trip. And here we are about to go underground; the excavations under St Peter's are extraordinarily fascinating. I see that Wesley College, where Methodists train their clergy, in Bristol is possibly to close. When I was in the seminary, there were occasional student exchanges with Wesley for a couple of weeks: I remember one visit of some Wesley students when they attended a lecture on Fundamental Theology given by (then) Fr (now Mgr) Michael Jackson (not to be confused with a certain pop star, currently dead). Fr Jackson made some allusion to dogma, at the very mention of which word there was a united gasp of horror from the Methodists present, as if the lecturer had said some particularly juicy swear word or blasphemed violently. Why I remark this is because the article in The Tablet, in which I read of the closure of Wesley, also mentioned that now the deacons for the diocese of Clifton would have to be found somewhere else to study. I do hope that somebody from the Clifton diocese will reassure us in the comment box that permanent deacons receive some Catholic theology somewhere. 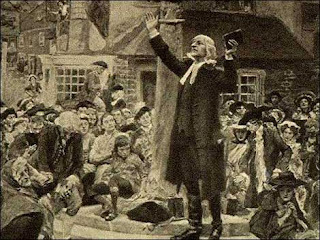 I would welcome it if the deacons could preach with all the enthusiasm and articulacy characteristic of Methodism, but I would be very sorry if the theology was equally characteristic.